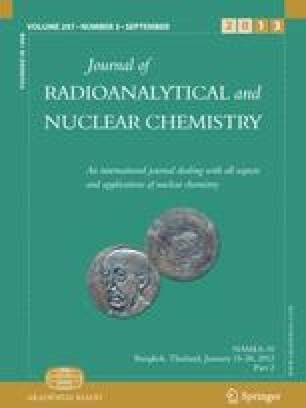 Adsorption of mercury(II) and methylmercury by two tannin sorbents was investigated using radiotracers. High sorption capacities for mercury are registered for both sorbents at pH 7. ForEucaliptus Saligna Sm sorbent (ETS) the maximum sorption capacity was 1.2±0.2 mmol/g and forLysiloma latisiliqua sorbent (LTS) was 8.5±0.2 mmol/g. Methylmercury adsorption maximum was recorded at pH 4 and in buffered solutions at pH2. This species can be recovered in the presence of mercury(II). Influence of different ions present in water was examined. High recoveries were reported for ETS in tap water samples but a decrease of uptake is observed for seawater.